Notes, scales, arpeggios, intervals, rhythms, chords, and so on. I think it’s useful to know all that stuff. I like to think of getting rid of it rather than adding understanding of it. I’m not learning my scales, I’m trying to make it so that there’s no friction between though and action (if you believe that there’s thought before action, maybe there’s action before thought – neuroscientists, chime in please). I think of it as removing obstacles, clearing pathways, enabling potential. 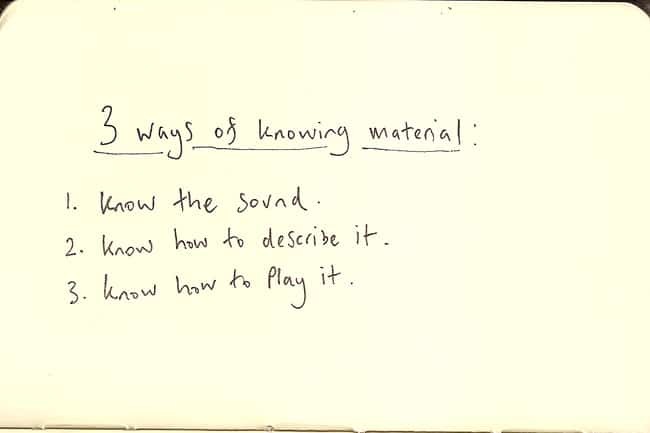 To know those things well, I try to work on three things: sound, description and playing. Sound – be able to sing it, be able to recognise it when you hear it. Description – be able to name the function of the notes, be able to name the note names. Play – be able to play it anywhere on the instrument. The last bit is the tricky bit because, on the guitar, there are so many ways to do things, and that’s why I think the naming thing can really help you out. If you know the fretboard really well, and you know the name of what you’re after, then being able to play A C E G in 50 different ways becomes easier than having to learn all those ways by rote.